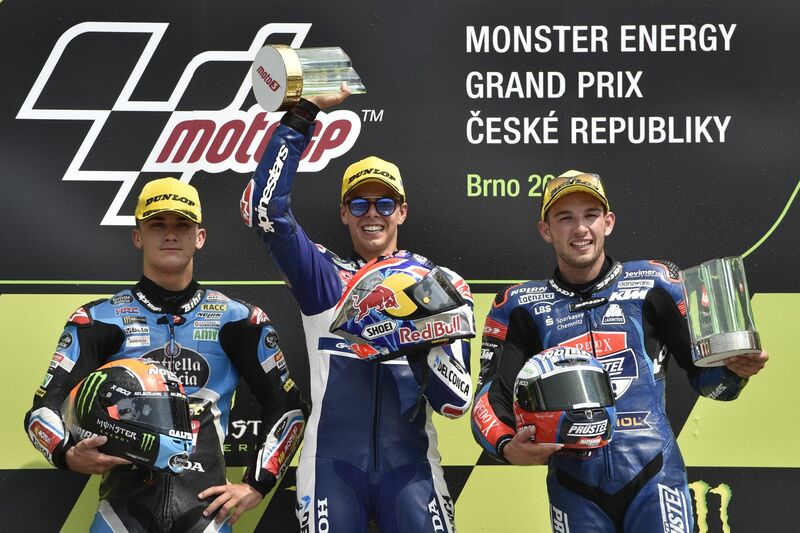 Jakub Kornfeil comes third in Moto3 at Brno MotoGP in “best result of career”; Andrea Dovizioso wins Czech Grand Prix; top three all win again in domestic soccer league; and Sparta’s Radaković apologises over Europa League exit. Arón Canet, Fabio Di Giannantonio, Jakub Kornfeil, photo: ČTK/Václav Šálek The local motorsport enthusiasts who turned out for the Brno MotoGP at the weekend had a lot to cheer about. 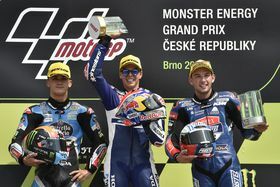 After his first ever first place finish in qualifying on Saturday, the Czech rider Jakub Kornfeil delighted fans with third place in the Moto3 class on Sunday afternoon. Indeed, the 25-year-old was the first Czech to reach the podium in 11 years. The dramatic race was won by Fabio Di Giannantonio of Italy, with Spain’s Aron Carnet coming second. Kornfiel described his placing as the best result of his career, saying that third spot at home meant far more to him than topping the podium elsewhere. The main event on the Brno Circuit, the Czech Grand Prix, was won by Andrea Dovizioso of Italy. Czech rider Karel Abraham finished 18. Brno was celebrating its 49th Grand Prix race, making it the second-oldest track to have continuously held such events, behind Assen in the Netherlands. 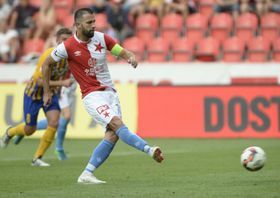 Josef Hušbauer, photo: ČTK/Kateřina Šulová The three main contenders for the Czech football league title again picked up all three points in the weekend’s third round of the league. Leaders on goal difference Slavia Prague overcame Opava 3:1, with Hušbauer’s wonder goal for the winners well worth searching out. Viktoria Plzeň beat Sigma Olomouc 1:0 and Sparta Prague achieved the same score at Slovácko, with the only goal coming from recent Ghanaian signing Benjamin Tetteh. 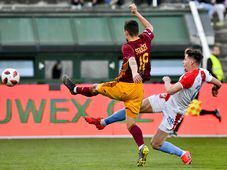 Sparta were in the spotlight going into the weekend, after failing to reach the final qualifying round of the Europa League. 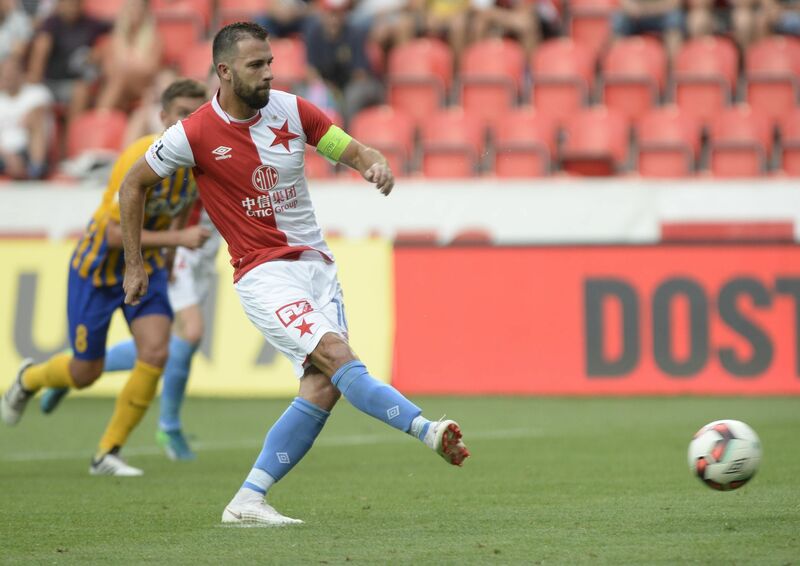 In the Prague side’s line-up was defender Uroš Radaković, who had infuriated fans after giving away a penalty against Serbia’s Spartak Subotica on Thursday, effectively killing that tie. Elsewhere, Milan Baroš scored a hat trick as Baník Ostrava beat Příbram 3:0. It is the second time the Champions League winner with Liverpool – now aged 36 – has achieved that feat with his boyhood club.